The H2O Fitness Seattle Wooden Rower has the same mechanical specs as the company’s RX rowers but adds a beautiful beech wood frame to give it the look of contemporary Scandinavian styling. Frame Length/(Seat) Height: 82.5" x 23"
UPDATE: The Wooden Rower is no longer available. Check out the latest H2O Fitness Rowing Machines on sale here. The H2O Fitness Seattle Wooden Rower features a polycarbonate water tank with internal stainless steel blades, a bungee cord pulley, dual rails, and a sliding seat with high impact rollers and industrial bearings. The 2" thick wood frame is made from premium grade, kiln-dried European beech wood. According to the company, the stock is milled to create an “arched radius finish” and then enhanced with Danish Oil to bring out the natural beauty of the beech wood’s grain. These well-built rowers from H2O Fitness get good reviews from satisfied users who enjoy the appeal of natural wood and the overall furniture-like look of this machine. The water tank replicates the sound and feel of rowing a boat, including the soothing sounds of water lapping the insides of the tank. There is no variable resistance on the Seattle Wooden Rower other than naturally self-paced; that is, the faster you row, the harder the workout. For an easier workout, simply row slow and steady. 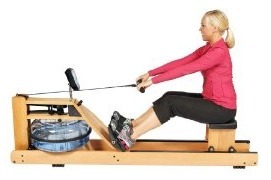 We feel that H2O Fitness does its best job on the RX-series of rowers and the wood frame is an afterthought. If you want a wood frame model, go with a WaterRower (that’s the name of the company), which produces a whole line of rowers made of cherry, ash, or black walnut wood so you can choose a color tone that matches your home decor. 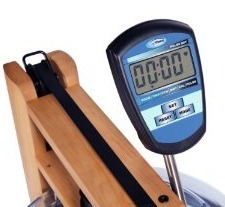 While there is nothing really wrong with this model, we suggest you skip the H2O Fitness Seattle Wooden Rower and check out the original WaterRower, which makes the best water resistance rowers on the market ranging in price from $999 to $1499.